A few months ago, be­fore the re­sults of the 2018 EA sur­vey came out, I asked if peo­ple would be in­ter­ested in mak­ing pre­dic­tions about the an­swers, and 35 peo­ple com­pleted a sur­vey of the sur­vey. 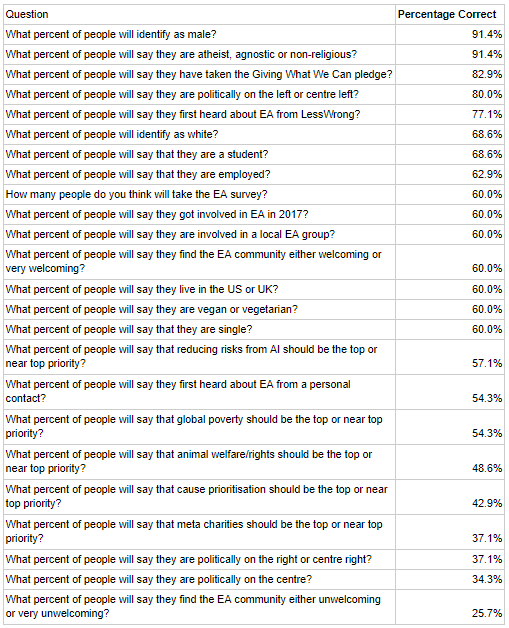 I think that the ma­jor­ity of peo­ple an­swer­ing this were from the group or­ganisers group on Face­book and so prob­a­bly have a bet­ter idea of what the EA com­mu­nity looks like in gen­eral, and hope­fully by test­ing our pre­dic­tions we can im­prove our cal­ibra­tion. 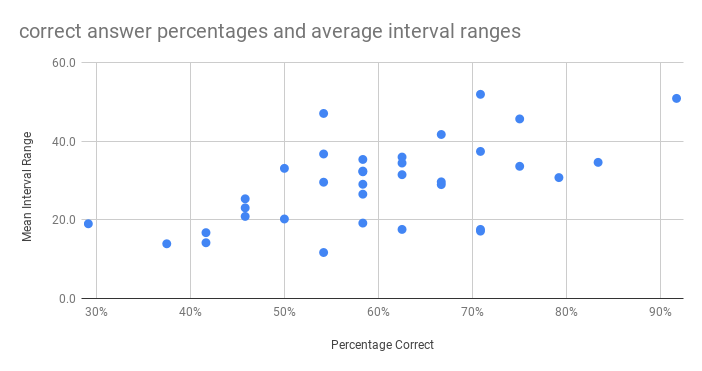 For each ques­tion the re­spon­dent was sup­posed to give lower and up­per bounds for which they thought there is an 80% chance that the an­swer is in­side those bounds. All but the first ques­tion would have an­swers as a per­centage be­tween 0 and 100. Here is the pro­gram, run by guided track. If you want to see the raw re­sults data for the sur­vey of the sur­vey you can email me us­ing david@ealon­don.com. The ques­tion with the most cor­rect re­sponses was on the pro­por­tion of peo­ple iden­ti­fy­ing as male, 91% got this one right. The chart be­low is show­ing the cor­rect an­swer per­centages and av­er­age in­ter­val ranges for the 35 par­ti­ci­pants. Here is a table look­ing at each ques­tion and see­ing what per­centage of the 35 gave a cor­rect an­swer to that ques­tion. 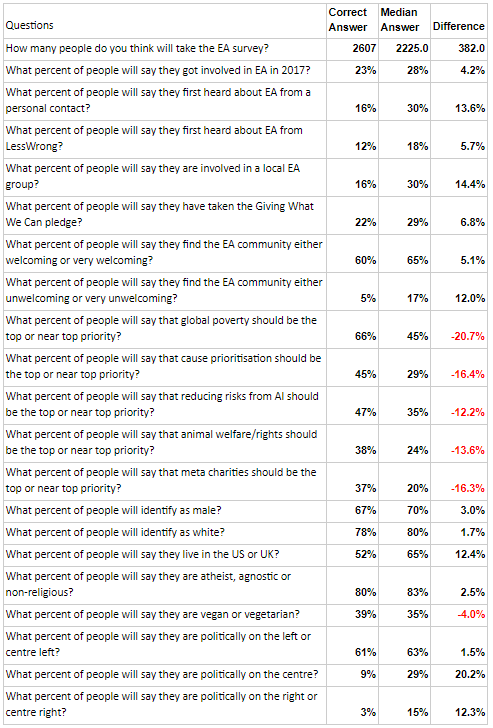 Here is a table look­ing at the me­dian mid­point an­swer for each ques­tion and how that com­pares to the cor­rect an­swer, with a pos­i­tive differ­ence sug­gest­ing peo­ple thought that the an­swer would be higher and a nega­tive differ­ence sug­gest­ing they thought it would be lower (on av­er­age). Do your “cor­rect an­swer” num­bers cor­rect for the peo­ple who put some­thing like “no an­swer” or “pre­fer not to an­swer”? I’d guess that most sur­vey re­spon­dents were ac­tu­ally guess­ing some­thing like “per­centage of peo­ple who give an an­swer, and for whom the an­swer is X”, even if they were sup­posed to be guess­ing “per­centage of all peo­ple who an­swer X”. “Cor­rect an­swer” is maybe not the best word­ing, it means the an­swer that Re­think Char­ity used to de­scribe their re­sults, and is also con­sis­tent with how they re­ported the re­sults in pre­vi­ous years. I should have pointed this out at the be­gin­ning of the sur­vey. In terms of the poli­ti­cal ques­tions, that is also shifted by a large re­sponse from peo­ple sup­port­ing liber­tar­ian or other poli­ti­cal views.